Aparna Pande is Research Fellow & Director of Hudson Institute’s Initiative on the Future of India and South Asia as well as Fellow, Center on Islam, Democracy, and the Future of the Muslim World. Aparna wrote her PhD dissertation on Pakistan’s foreign policy. Her major field of interest is South Asia with a special focus on India, Pakistan, Afghanistan, Foreign and Security Policy. Aparna contributes to The Weekly Standard, Huffington Post, Real Clear World, Times of India, Outlook India, Pajamas Media, IndoLink and Chowk. A 1993 graduate of Delhi University, Aparna holds a Master of Arts in History from St. Stephens College at Delhi University and a Master of Philosophy in International Relations from Jawaharlal Nehru University. Aparna Pande received a Doctorate in Political Science from Boston University in 2004. Aparna Pande’s first book titled ‘Explaining Pakistan’s Foreign Policy: Escaping India’ was released in March 2011 by Routledge. Aparna Pande’s second book ‘From Chanakya to Modi: Evolution of India’s Foreign Policy’ (Harper Collins India) comes out in July 2017. 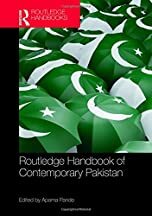 Aparna Pande is also the editor of ‘Routledge Handbook of Contemporary Pakistan’ (Routledge, August 2017). A South China Sea Change? In an interview on WBUR’s On Point, Aparna Pande discussed the developing situation between India and Pakistan. Aparna Pande is interviewed by Axios World on what could happen next time India and Pakistan raise tensions. Aparna Pande quoted by the Press Trust of India on the Sri Lankan president’s decision to remove the country’s prime minister.